My Dining Partner (MDP) and I are doing a new thing where we eat dinner at home on Saturday nights and go out for brunch on Sunday mornings. It’s working well, as I love to cook, and now have the opportunity to get brunch at all the restaurants I’ve been dying to try. This morning, we went to The Dutch down on Sullivan and Prince streets. I had been aiming to visit The Dutch for their dinner menu sometime, but a coworker recommended the brunch, thus our trek down to SoHo at 9 am. We had a reservation for 10, and the hostess kindly sat us at one of the nicest tables in the restaurant. With loads of sunlight pouring in through the windows that form two of The Dutch’s walls, the setting was both vibrant and serene. The low bustling of patrons formed a quiet din, and the perfect, color-accurate light made even the wood banquet I sat upon come to life. I encourage you to try The Dutch in the morning to experience this glorious atmosphere. To start, we ordered a maple potato doughnut (though they spell it as “donut,” a la Dunkin Donuts, on their menu) that was served warm and gooey. This doughnut is nothing like the offerings of Dunkin Donuts, however. It was lemony and had a dense, cake-like bite. MDP and I polished off the plate in no time. 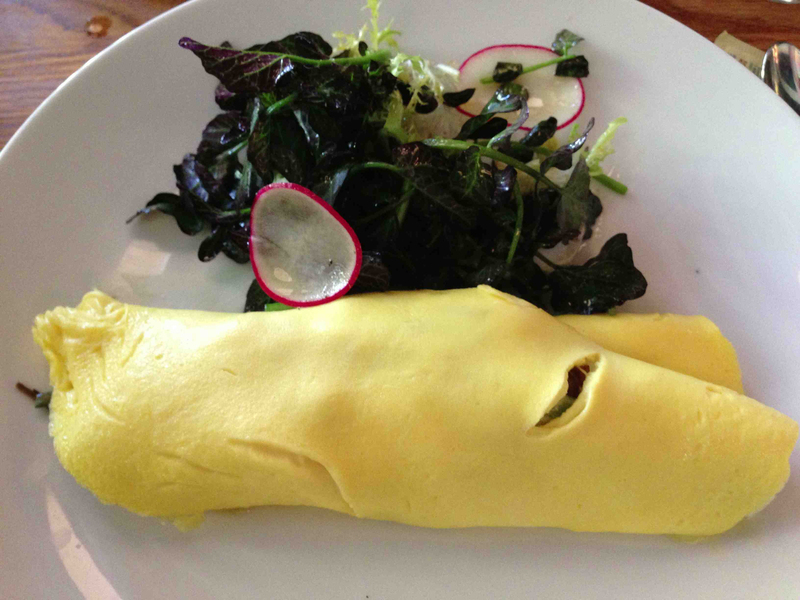 For my entree, I ordered the omelette filled with crisp asparagus, ramps, creamy goat cheese and oyster mushrooms. I have never seen such a perfect omelette in my life. The texture was borderline silky and the inside was eggy and delicious. Rife with fillings, the thin, streamlined exterior of the omelette belied the hearty, delectable innards. I was in love. And the omelette came with a nice little salad with leafy greens and sliced radishes strewn throughout. Yum! 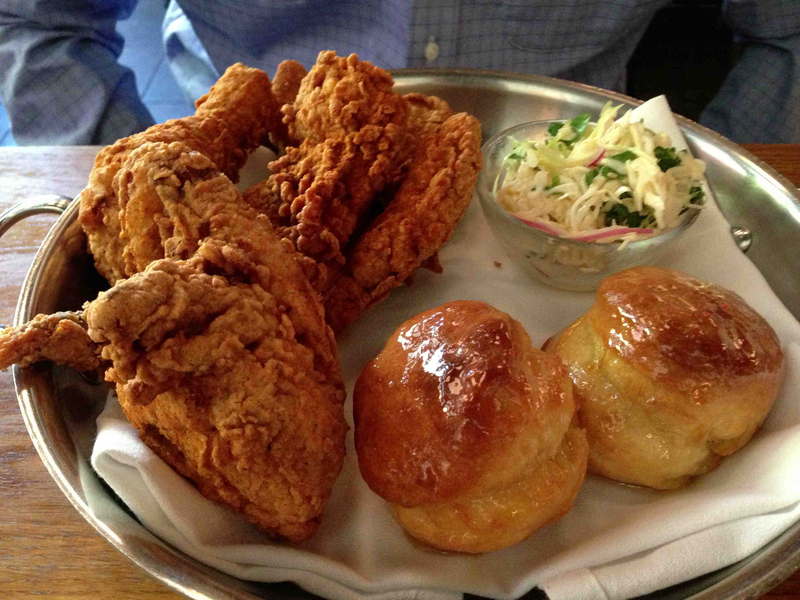 So enchanted by the appearance of fried chicken on any menu, MDP opted for the hot fried chicken with honey butter biscuits. I was told that the biscuits were a central pillar of The Dutch brunch experience, so I was certain to ask the waiter how many came with MDP’s chicken dish. Two, he said, which is the best and most delicious response he could have possibly uttered. Drenched in sweet honey, the biscuits were out of this world. So buttery, so fluffy, I could have easily eaten two on my own. The chicken’s fry batter was heavily peppered and spicy for a nice flavor. The chicken itself was tender and perfectly cooked. On the side, they added a small dish of coleslaw, which incorporated red onion and parsley to create a coleslaw unlike any I’ve ever tried–that is, a very good one (though MDP wasn’t a fan). I highly recommend The Dutch for brunch. And their dinner menu looks stellar, but do make a reservation. The Dutch is definitely hip, and you may have trouble obtaining a table as a walk-in. Take the N/R to Prince Street. Walk west a few blocks to Sullivan. Enter on Sullivan Street.